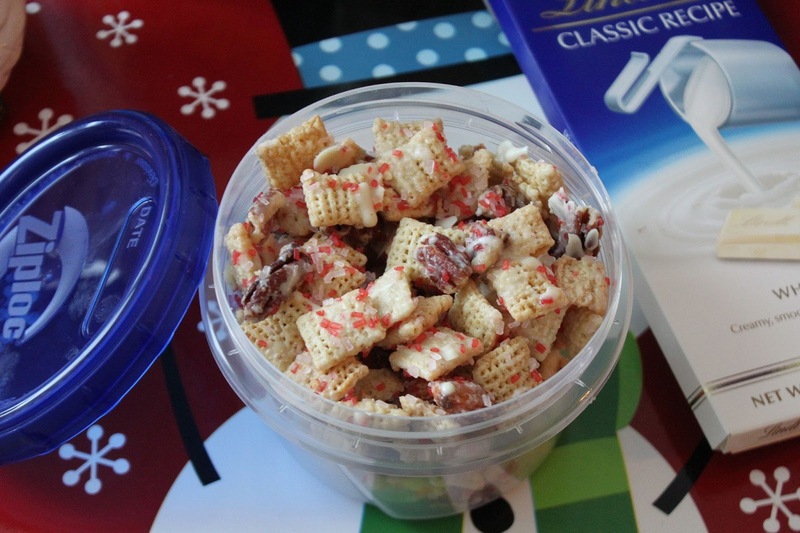 Beautiful Incentives: White Chocolate Vanilla & Peppermint Chex Holiday Party Mix. Plus, win $10! White Chocolate Vanilla & Peppermint Chex Holiday Party Mix. Plus, win $10! Looking for a simple yet delectably sweet party mix for the whole family? You've come to the right place. I partnered with Publix and Linqia to bring you my own recipe, made especially for the holidays. This white chocolate vanilla and peppermint Chex party mix is super simple and only takes a few ingredients you probably already have. I bought some Vanilla Chex cereal from Publix and pondered what would be something yummy but somewhat unique. That's when I thought of peppermint. What screams winter more than that. I'd never mixed that with cereal before and I knew it went well with vanilla anything and any kind of chocolate, so I thought they would go great together and they really do. The peppermint is subtle there enough that it really complements everything. 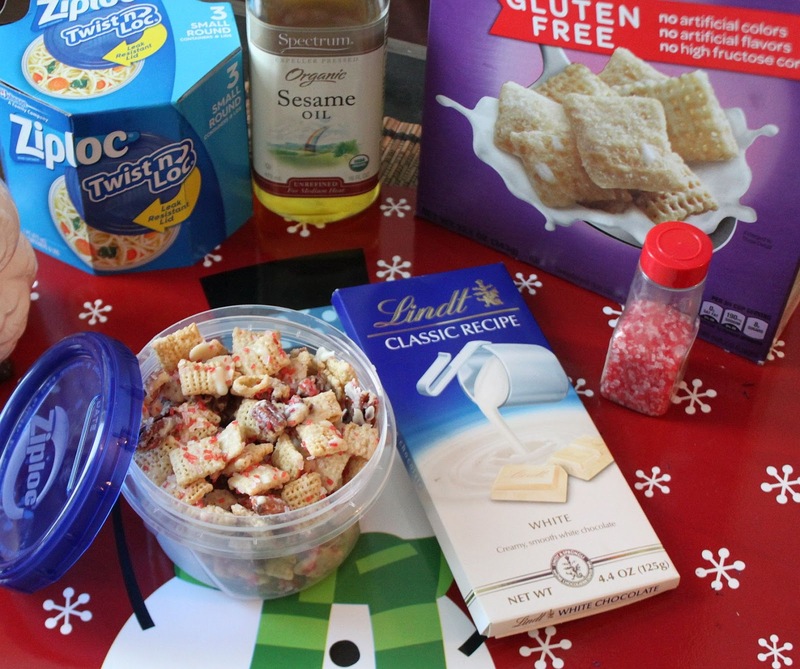 If you plan to make this recipe or any with chex, make sure to grab current coupons at Publix! 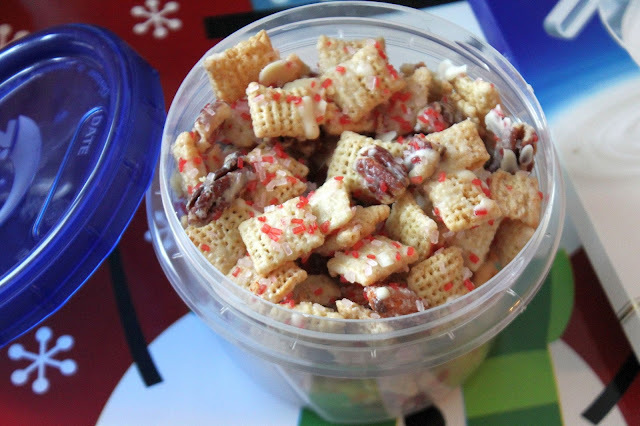 White chocolate Vanilla Peppermint Chex Mix. 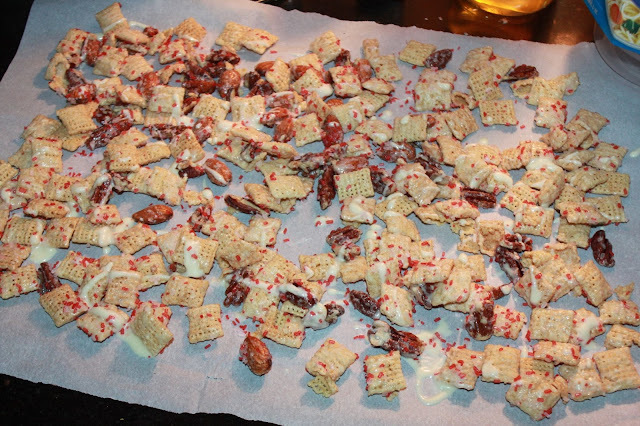 Gluten Free Vanilla Chex- two cups, about 1/4 cup mixed pecans and almonds or less. The amount is to your liking. You can never have too much though! Half a bag of Lindt white Chocolate, 1 TBLSPN Sesame oil or oil of your choice. And red and white peppermint sprinkles. Add 2 cups of Cinnamon Chex to a mixing bowl. Add 1/4 cup mixed nuts the bowl. Take a small bowl and break the chocolate pieces into it. Heat in increments of 20-30 seconds until softened. Don't overcook. Check often. Then mix in the TBLSPN of Sesame oil until blended well and chocolate becomes a bit thinner. Next, pour half of the white chocolate/Sesame mix into the bowl of chex mix and stir around with a spoon. Ensuring you cover all the mix. Grab a piece of parchment paper, put it on a shallow pan and spread the mix out on it. Then drizzle the remainder of white chocolate/Sesame oil across all of it. Next, add the sprinkles. Once spread out and sprinkled, stick in the fridge preferably over night or for at least an hour to get the mix nice and chilled. When you are ready to serve, pour some extra sprinkles and serve right when you plan on eating. They melt somewhat from the heat of your hands, but it's really not that messy. 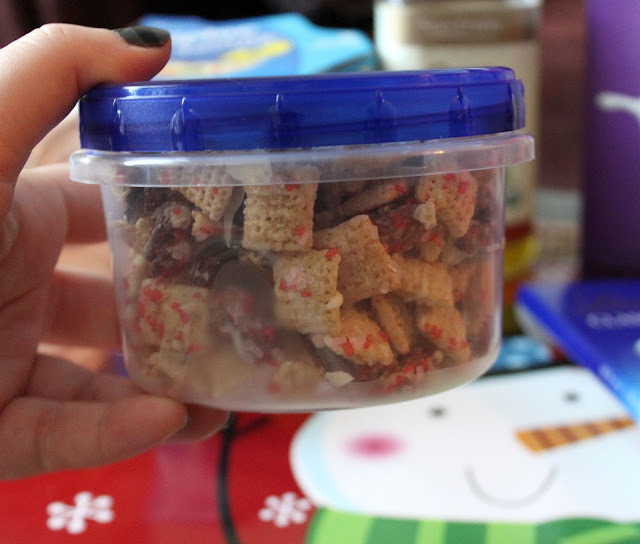 These ziplock containers are perfect for gift giving or anytime you need to pack for snacks on the go! These containers come 4 to a pack and they were just a little over $2! They are very durable and the lids feel very secure when they're on! Easy to make it. Easy to take it. And now for the $10 PayPal to buy your own ingredients for this delectable party mix! The rules are simple, just leave a comment saying what mix you would make and don't forget to leave the e-mail you can best reached at! Giveaway open to USA only! Winner must respond within 48 hours or another will be chosen. mix kids love a chocolate peanut butter chex mix with pretzel pieces! I would use milk chocolate and add pretzels and peanuts. Red Velvet Chex® Party Mix is the one I would make. Oh that looks so yummy! I would love to make the Chex Muddy Buddies!